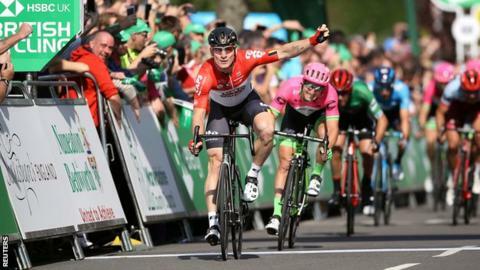 German sprinter Andre Greipel picked up his second win at this year's Tour of Britain with victory on stage four. The 36-year-old Lotto-Soudal rider outlasted Italian Sacha Modolo, with overall leader Patrick Bevin finishing third. New Zealander Bevin of BMC extended his advantage by picking up four bonus seconds. Australia's Cameron Meyer is now four seconds behind and Julian Alaphilippe of France is two more seconds back. Greipel told ITV4: "The guys did a really good job to keep me up there, it was quite messy. "I knew it was going to be a long sprint but I wanted to go full gas from the final corner, it worked out perfectly I guess." Thursday's stage five is a 14km team time trial from Cockermouth to Whinlatter Pass in the Lake District.